Around 43 percent of lodge pole pine-dominated forests in Colorado are currently beetle infected, and more than 1.5 million forest acres in the state are expected to succumb. 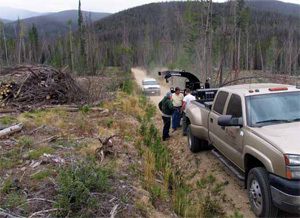 Fraser Experimental Forest, USFS, Bandit and others are finding markets for the biomass. The Fraser Experimental Forest in Fraser, Colo., is serving as a laboratory for the use and value of biochar for the timber industry. The driver behind the research is the mountain pine bark beetle (MPB). In the northern Colorado Rockies, pine beetles reached outbreak levels about 11 years ago, according to Chuck Rhoades, research biochemist with the U.S. Forest Service’s Rocky Mountain Research Station in Fort Collins. Rhoades says about 43 percent of lodge pole pine-dominated forests in Colorado are currently infected, and more than 1.5 million forest acres in the state are expected to succumb. Within outbreak areas, mortality often exceeds 80 percent of the overstory in mature lodge pole pine stands. Pine mortality from the current MPB infestation was detected at the Fraser Experimental Forest in 2003. The following year, epidemic-level beetle emergence was measured at three locations in the forest, and by 2007, the beetles had infested overstory lodge pole pine throughout the forest. Looking at the wider devastation, Forest Service data indicates over 17.5 million acres of lodge pole pine forests in the western U.S. have been impacted — even infested or dead — by the MPB. More than 3.6 million acres of lodge pole pine mortality are in the forests of northern Colorado and southern Wyoming. The Bandit 990XP was used for the project because it was cost effective when chipping 9-inch trees — the majority of the infested trees. So what can be done with all the woody biomass? That’s what Rhoades, McCollum, and others from the Forest Service are looking to find out. They are working in partnership with Bandit Industries, which sold the Forest Service a Bandit Model 990XP 12-inch drum chipper, to turn the dry mass into chips. 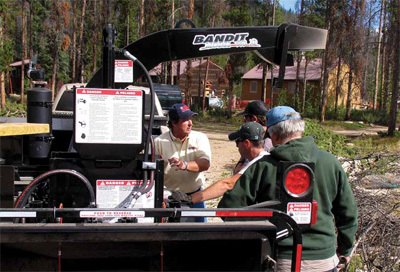 Jeff Brown, general manager, Global Machinery, Denver (a dealer for Bandit Industries in Colorado), says Bandit and the Forest Service initially started the cooperative project, and Global delivered the unit and trained personnel on operation and maintenance. According to McCollum, the biomass from the pine trees needs to be removed for many reasons: to restore and improve forest health; reduce the risk of catastrophic wildfire; reduce hazards resulting from insect and disease-killed trees; and contribute to forest management and maintenance, such as road removal, trail maintenance, soil restoration projects, and others. McCollum says the Forest Service hasn’t converted very much biomass into chips yet, only about 40 or 50 cubic yards to make biochar for its research studies. “Biochar is a fine-grained charcoal high in organic carbon and largely resistant to decomposition,” he explains. It is produced from pyrolysis of plant and waste feedstocks. Pyrolysis is a process in which organic matter is burned in the absence of oxygen or with very limited oxygen. And the Forest Service’s research is focused on using woody biomass as a feedstock from which to make biochar. McCollum says most of the biochar created has come from a process called slow pyrolysis in which feedstock chips are heated to 400 to 600 degrees Celsius. The chips are actually delivered to a company called Biochar Engineering in Golden, Colo., which produces the biochar. Biochar is useful as a soil amendment or supplement, McCollum noted. The biochar attracts and holds water, lowers the bulk density of the soil, makes the soil more porous, and enhances the absorption of ammonium. “When mixed into the soil, biochar stirs vegetation, reduces erosion, and “restores” damaged soils,” McCollum says. Although some residual material is sold to paper mills and others, demand is usually cyclical, and prices have been down in recent years. “Biochar offers an alternative use for residual and waste material,” says McCollum. 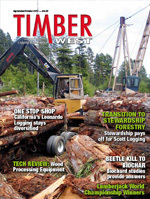 “In many ways, the timber industry provides an ideal platform for biochar production. 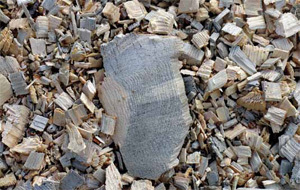 The readily available supply of feedstocks and the capacity to use co-products of biochar, like heat (biochar can be co-produced with heat for use in space heating and kilns) and snygas (short for synthetic gas, which is like a lower energy natural gas), could combine to make biochar an attractive product line to add to a timber facility,” McCollum says.